The strong dollar will test China’s financial markets and economy. Beijing is learning about bond vigilantes. Last Thursday, after the U.S. Federal Reserve raised interest rates and projected more rises next year, China’s bond market fell out of bed. Investors are realizing that despite the government’s best efforts to prepare and isolate the domestic economy, China remains vulnerable to a stronger dollar. Bond trading had to be suspended briefly on Thursday until the People’s Bank of China injected about $22 billion into the money markets to calm nerves. 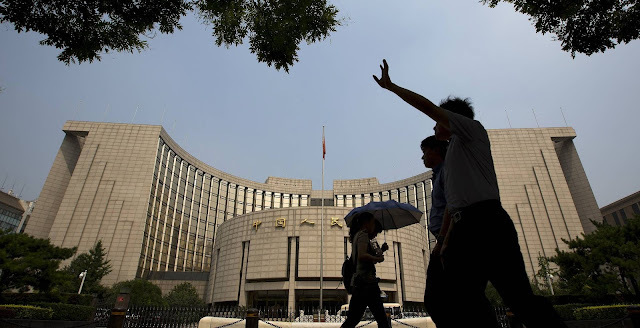 The PBOC also extended emergency loans to financial firms to encourage them to keep trading, a positive sign that the authorities have learned from their mistake of suspending stock trading after the June 2015 stock-market crash. But corporate-bond yields continue to rise and new issuances have been cancelled. Government interference had pushed China’s bond market into bubble territory over the past two years. Beijing encouraged companies to issue bonds to reduce their reliance on bank lending, while prodding others to buy them. The authorities also rescued troubled companies to prevent them from defaulting, which has led to a fundamental mispricing of risk that will make the correction all the more painful. As always, the bursting of a bubble reveals who was swimming naked. Last week, brokerage Sealand Securities defaulted on a bond-financing transaction allegedly made by a rogue employee. Rumors are also circulating that investors are pulling their money out of funds holding bonds. Firms that used high leverage to deliver promised returns now face margin calls. The larger question is whether China’s real economy is itself a bubble. According to official figures, bank lending and social financing are growing at roughly double the rate of GDP. Total debt now stands at 260% of gross domestic product, up from 154% in 2008. That doesn’t count the trillions of dollars in loans that banks have classified as “investment receivables” and other such dodges. China’s central bank tried this year to tighten credit, but its power is limited. The People’s Bank of China shares oversight with the China Banking Regulatory Commission and China Securities Regulatory Commission, an arrangement that allows financial institutions to move assets around to deceive regulators. Powerful interests within the government also want to keep the money spigots open to hit growth targets. But questions about the durability of that growth are increasing. Easy money has eroded productivity. Companies evade capital controls and move their money abroad into dollars. Beijing’s foreign-currency reserves, while still massive, shrink month by month. Keeping the yuan from devaluing too quickly will require raising domestic interest rates, which will hurt growth and cause some companies to fail. Even though the Chinese bond market doesn’t price risk accurately, it still reflects interest-rate expectations. Last week’s mini-tantrum suggests investors understand that China’s central bank won’t be able to keep rates low if the Fed carries through on its promised tightening. A stronger dollar is set to test China’s financial institutions and its real economy. 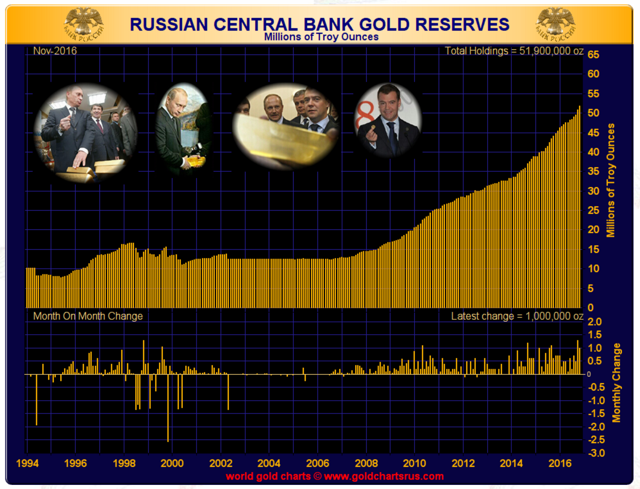 Russia Just Released Its Gold Purchases For November - And It's A Doozy! 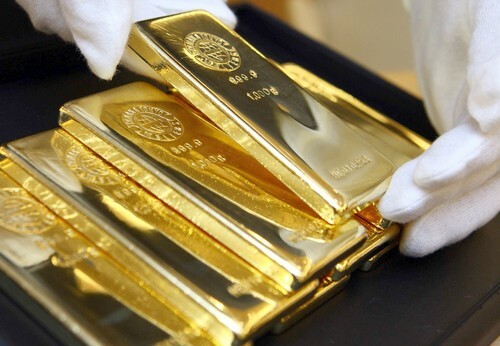 - Russia followed up its October gold purchase with another 1 million ounces bought in November. - This significant purchase signifies that the country was not just purchasing gold in October to hedge the possibility of an anti-Russian US president. - The Russian central bank thinks there is value in owning gold as we move forward, and we believe the same. A few days ago, the Russian central bank released its gold reserve data for November, which is something we have been anxiously waiting for since the country's record-breaking September purchase that we detailed in our last piece. To rehash, the reason November gold purchases were so important to us was because it would give very important insight into what the Russian central bank thought of the global financial system moving forward. If Russia followed up its strong October gold purchases with a relatively small purchase in November, that could signify October's massive purchases were simply U.S. election hedging with the expectation that an anti-Russia regime (Clinton) would come into power. Of course, since Trump was elected, there would be little reason to buy gold as a U.S. political hedge, as he is expected to be pro-Russian. If Russia followed up its October purchase with a large November purchase, that would signify to us that October's purchase was not merely U.S. election hedging, but rather something related to Russia's view of the financial world. In this case, the reasoning in quickly purchasing so much gold could be to hedge/replace its bond holdings. It would be a logical move, as the recent rise in bond yields lowers the value of existing bond holdings - and Russia holds a lot of bonds. Thus, with the massive rise in bond yields in November, we would expect the country to purchase even MORE gold in November, if that was its reasoning. So let us look at what Russia did with its gold holdings in November. It turns out that during the month of November, Russia decided to add another 1 million ounces of gold to its reserves (around 34 tonnes). That suggests the massive buying of gold in October was not necessarily related to hedging a Clinton presidency. It seems the Russian central bank views gold as a very attractive asset and is willing to continue to buy large amounts of the metal despite the overwhelmingly negative sentiment surrounding gold. Last month, Russia bought around 48 tonnes of gold, and adding that to this month's 34 tonnes, it has bought around 2.5% of total world gold production over the past two months. That is significant. Russia's purchase of 1 million ounces of gold for its reserves tells us quite a bit about the country's view of the future of the financial system, and that gold seems to be an important part of it - this wasn't just U.S. election hedging. This supports our view that despite the current negative sentiment in gold, there may be a very bright future in owning the shiny yellow metal. Could it be that the great bond market run is over and large bondholders (think central banks) are starting to diversify their holdings? Or is the financial system in much worse shape than equity markets are pricing in? Or will we start to see some inflationary consequences of the trillions of dollars of QE that worldwide central banks have unleashed? For all the above-mentioned scenarios, gold makes an excellent bond hedge and would explain Russia's willingness to add significant amounts to its reserves over the past few months. We also would not be surprised to see some major buying from the Chinese central bank after the bank's comments that it might make "tactical adjustments" to its U.S. bond holdings. Remember, when it comes to central banks, it doesn't take much in the way of reserves to purchase significant percentages of total world gold supplies - especially when it comes to the physical gold market. In sum, investors need to be patient and realize that there is a lot of value in holding gold despite the negative price sentiment. As the year comes to an close, we examine how our forecast for 2016 fared. In December 2015, Geopolitical Futures published a forecast for 2016. It was our first annual forecast and covered the most significant developments we anticipated for the year. In July, we published our mid-year report card that tracked the progression of our most important predictions. Here, we provide our final evaluation of these forecasts. We believe it is important to evaluate our performance in our most pivotal role – forecasting. You will notice that some items below have been given an NF (not forecast) score. These items are key events that happened throughout the year but were not included in our 2016 forecast for various reasons. These reasons are explained in detail below. We present a summary of our evaluation below, followed by a detailed explanation of our performance and grading. 1. "2016 will be a year of not complete but very significant fragmentation in Europe. The EU will face the most intense tests in 2016. These tests may involve the formal secession of some member states from the EU. More likely, the central apparatus – the EU itself – will appear irrelevant or even hostile to various nation-states." The U.K. has decided to leave the European Union and will begin the official withdrawal process early next year. Nations like Spain and France have ignored EU regulations on budget deficits and faced no repercussions. Poland and Hungary are examples of other countries that have defied the EU and faced no practical consequences. Italy’s banking problems have brought Rome and Berlin into direct conflict. The constitutional referendum on Dec. 4 brought down Prime Minister Matteo Renzi’s government and could open the door to Euroskeptic parties looking to redefine Italy’s relationship with the EU. 2. "Italy will be facing serious banking problems in 2016. How serious they are will depend in large measure on how rapidly the rest of Europe recognizes the problem and is willing to create solutions. Given Europe’s track record, speed is unlikely and this can create a crisis far more challenging than Greece’s later in the year. If, as we expect, Italy will face significant problems, this will force Germany to make extremely painful and politically unpopular decisions." We identified Italy’s banking woes as a key problem for this year well before they gained traction in mainstream media. Italian banks are searching for answers and moving debts around but no solution has come yet. Arguably, the situation has not yet created a crisis far more challenging than Greece’s. However, it has become the defining part of a conflict between Germany (and the EU) and Italy. None of Italy’s major banks have defaulted yet, and the EU has not faced an actual failure of the Italian banking system yet. However, the economic problems prompted the government to propose constitutional changes to help the government better deal with these problems, and the referendum on these changes led to Renzi's resignation. In our view, our forecast is accurate, but we must acknowledge that our use of the word “crisis” was vague. 3. "Germany, key to all three of the EU’s dilemmas, is exceptionally vulnerable economically and, understanding this, must play a complex game." Germany’s dependence on exports, exposure to Italy and the EU’s fragmentation represent fragile points in the German economy. Some of the country’s largest banks are in trouble and some German companies have shown initial worrying signs regarding growth. However, the banks have managed to negotiate solutions to problems thus far and general business sentiment appears to be fairly good. Berlin’s talks with the U.S., U.K., Italy, Turkey and Russia have been very calculated, as it tries to balance domestic demands with external politics. 4. "Europe will become a crazy quilt of opened borders, conditionally open borders and tightly controlled borders. And the advocates of a Europe open to all refugees will be not only on the defensive, but will have to agree to tightly controlled residences for any refugees — in other words, camps." On the first point, border controls are still a reality. In early November, as a result of requests from Germany, Austria and Denmark, the European Commission was looking to extend border controls for at least the next three months. The EU wants to reinstate free and open travel within the Schengen Zone, but those entering Germany, Austria, Denmark, Sweden and non-EU Norway all face border checks. After the Nice attack, Italy, Spain and Germany all tightened border controls. French politicians are under pressure right now to renegotiate border checks with Britain. On the second point, refugee flows into Europe have slowed – but are still noteworthy. France recently cleared the infamous Calais “jungle” refugee camp – and simply relocated the asylum seekers to other camps or “asylum centers,” as they are sometimes called in the media. Greece has come under scrutiny for the allegedly deplorable conditions of its refugee camps. This gets less scrutiny because the refugee story has become a fact of life, but the refugee issue is still a driving force in European politics. 5. The British public voted in a referendum to exit the European Union. We had no specific forecast on Brexit. However, we did forecast that the EU would fragment. The EU is fragmenting without dissolution, as nations simply ignore its rules. Furthermore, elections are inherently unpredictable and Brexit is one of many elections in 2016 that yielded “surprise” results. 6. "We predict there will be a settlement in Ukraine in 2016, whether formal or informal. The Russians will build up their military and the United States will continue to strengthen the containment line. The Ukrainian question, along with the general question of the buffer states between Europe and Russia, will be reopened. But not in 2016, with economic and strategic problems weighing Russia down." In our forecast, we referred to a “formal or informal” settlement. Discussions between Russia and the U.S. have been held and Russia has been seen as reaching out to the West (the U.S. and the EU). However, there will be no formal settlement in 2016 given that the U.S. is transitioning between administrations following the election and it will take a while for negotiations to be reorganized. What has appeared is a frozen conflict, which is considered a type of informal settlement. Russia and the U.S. (through NATO) have reinforced their forces in the Baltic states and the Black Sea region. We’re also seeing the very beginning of this process in the Balkans (in Serbia and Bulgaria) and further to the east (in Moldova and Belarus). For the moment, the West is gaining ground over the Russians. Russia has entered its second economic recession in less than 10 years. The government has seen revenues decline since the drop in oil prices, considering that more than 50 percent of budget revenue comes from oil exports. Russia may exhaust one of its reserve funds next year due to declining oil revenue. Additionally, more than 2 million people fell into poverty in 2015 as wages fell by 9 percent. 7. "The U.S. will continue to deploy resources from the Baltic to the Black Sea. The American defensive line – including the Baltics, Poland and Romania – will fear this accommodation is a preface to a Russian-dominated Ukraine." The U.S. has deployed additional resources to boost the defenses of these countries. Countries on the containment line from the Baltic to the Black Sea – Latvia, Lithuania, Estonia, Poland and Romania – have agreed to host multinational forces within the NATO framework. They see Russia building up its military forces in these regions and perceive Russian economic problems to be a preface to Moscow’s more aggressive stance. 8. "Germany will be delighted to have the additional fear of a confrontation to its east eliminated. And the rest of Europe, preoccupied with other problems, will be indifferent." The interests of the U.S., Central Europe and Western Europe are diverging when it comes to Russia. Moscow is working to take advantage of these splits within the Western alliance. The U.S., as a result, is straining to ensure that its allies remain firmly in its camp. The U.S. does not wish to bear the burden of containing Russian ambitions on its own and is continuously working to enlist the assistance of a range of allies, especially in Central and Eastern Europe, to implement Washington’s strategic goals. Nevertheless, with the U.S. still in the process of boosting its Eastern European NATO allies’ defenses, Germany’s position towards Russia is not yet clear. 9. Russian President Vladimir Putin consolidated power through the restructuring of the security apparatus. The country’s economic problems have weakened Putin’s position and caused some unrest in the regions. Sensing the dangers that can stem from unrest, Putin this year established a National Guard and fired his long-time aide and chief of staff Sergei Ivanov and three regional governors (who were replaced with his personal bodyguards). 10. "In the coming year, IS will continue to be the single largest force in the Syrian-Iraqi theater. We can expect the group to expand its activities in countries such as Saudi Arabia, Egypt, Yemen and Libya. At the same time, it may even increase its presence beyond the Arab world in sub-Saharan Africa and southwest Asia. IS’ focus, however, will be to defend its core turf in the Levantine-Mesopotamian battlespace where it will be able to hold on to most of the areas it currently holds and even push into areas that are either held by the Bashar al-Assad regime or by rival rebel groups." IS continues to be the largest actor in the Syrian-Iraqi battlespace. Its core turf in area remains secure – it has been threatened but no force has yet emerged that can push it out of its strongholds. Despite, the attempts to take back Mosul, the group remains in a defensible position, though as the fight wears on IS will wear down, too. But it continues to stage attacks in Saudi Arabia, Egypt, Yemen and Libya and has expanded operations to Nigeria, Afghanistan and Pakistan. 11. "American efforts against the group are unlikely to yield the desired results in the coming year. It is possible that IS could suffer tactical setbacks but strategically dislodging it will be extremely difficult." The Islamic State has suffered a number of tactical reversals including the loss of population centers such as Ramadi and Fallujah in Iraq, as well as Manbij in Syria. But dislodging it from its core turf is proving very difficult. In Raqqa, IS’ opponents lack the forces necessary to take over the city. The only force that the U.S. has currently is largely made up of the Syrian Kurds, which Turkey vehemently opposes. The shaky coalition that has been mobilized to retake Mosul suffers from more or less the same problems. While involved in a joint operation the Shiite-dominated central Iraqi government is not exactly on the same page with the Kurdistan Regional Government. Kurdish forces and a Shiite-dominated national security force trying to take a Sunni town presents its own challenges. Finally, Turkey trying to jump into the fray, which has elicited a strong response from Baghdad, has further amplified the problem. The U.S. has avoided any direct action against IS beyond airstrikes, drone strikes, special operations forces actions and intelligence missions. In terms of ground operations, it has relied on the Syrian Kurdish-dominated Syrian Democratic Forces, which has had limited success. Likewise, the Russians have been far more focused on helping the Bashar al-Assad regime retake areas from the rebels than attacking IS. 12. "Turkey is facing Russian and American demands for involvement. Given Turkish dependence on Russian energy and its ultimate strategic dependence on the U.S., resisting both of these countries will be impossible. The process of engaging IS will not be a sudden overwhelming move into Syria, however, we expect a slow but steady increase in Turkish operations. ... Turkey’s engagement with Islamic State will be the key event in the coming year in the Middle East, not only because it addresses IS, but also because it will mark the emergence of Turkey as a regional power. ... IS has set the agenda for 2016 and the manner in which Turkey changes its posture will be a defining shift." While still resisting pressure from the U.S. and pressing Washington through the Syrian Kurds, the Turks have moved to end hostilities with Russia that emerged after Turkey shot down a Russian warplane in November 2015. As the year has rolled on, Turkey has gradually increased its involvement in Syria with airstrikes, artillery barrages and backing for Syrian rebel militias, along with a very limited amount of troop and armor deployment. Turkey has slowly begun to strike at IS. Its ability to steer U.S. policy on the Syrian Kurds and its efforts to get involved in the fight in Mosul show that it is in the early stages of emerging as a regional power, but it still has substantial arrestors that it has to overcome. Israel has refrained from any major strategy change, continues to live with low-level violence and from time to time carries out attacks in Syria to prevent Hezbollah from gaining any major advantage. The Saudis continue to test their abilities through their involvement in the war in Yemen without taking on any major challenges. 13. A coup was attempted on July 15 in Turkey but ultimately failed. We thought that the ruling Justice and Development Party had consolidated and faced no domestic challenges. 14. "Our forecast for the coming year in China is that the current growing dictatorship will moderately intensify..."
President Xi Jinping’s ostensible anti-corruption crackdown has continued, cementing his internal political power within the Communist Party. During October’s Plenary Session, Xi was declared the “core” leader of the party, demonstrating growing loyalty and obedience. Xi has also tightened his grip on the People’s Liberation Army. In addition, China has intensified government control over citizens, moved to control any hints of regionalism (particularly in the semi-autonomous Xinjiang region), and has limited social unrest and public demonstrations. With this end in mind, the government has increased regulation of the education system and the media. 15. "… and the underlying economic problems in China will grow as well, with more spasmodic events, such as the 2015 stock market collapse or sudden revaluation." This year, China’s deep underlying economic problems have manifest through the ongoing depreciation of the yuan, capital flight and, counter-intuitively, the country’s booming housing market. Issues also are mounting related to local government debt and corporate debt. The government has enacted an array of policies and doctored balance sheets throughout the year to manage and mask its structural problems. 16. "Exporters of industrial minerals and exporters of industrial products are now paying the price and we expect 2016 to be a year of great difficulty for the periphery of East Asia." Countries that have significant exports to China have seen economic difficulty in 2016, though the severity ranges. South Korea’s exports remain on the decline and social unrest is on the rise. Japan’s economy remained stalled, though the country has avoided mass unrest. Australia has seen less economic pressure than we originally anticipated, but its main economic activity is closely entwined with the exporters’ crisis. 17. "Central Asian countries will be unable to diversify away from Russia and China in 2016. Protests over weak currencies and job cuts may take place, but economic downturn appears not to fundamentally threaten the position of Central Asian regimes, which have proved successful at using a mix of incentives and coercive tools to maintain power." Central Asia has seen significant instability in 2016. However, the writ of the regimes remains entrenched. Kazakhstan went through a major reshuffle of its top leadership to deal with a weakened economy due to depressed energy prices, civil agitation and Islamist terrorism. Uzbekistan lost the only president it has had since the country became independent 25 years ago and is undergoing a delicate transition with no disruptions thus far. The global economic downturn has created a situation where civil servants in Turkmenistan have not been getting paid on time and there are reported food shortages, however, the government continues to weather these challenges. 18. "The Chinese will use the South China Sea as a means of increasing nationalism in the country and legitimizing the Communist Party’s rule, even though China is struggling to maintain its status as a regional power. … We do not expect the South China Sea to consist of more than demonstrations and feints on either side." The South China Sea has been largely stable. China has used the South China Sea dispute to stoke nationalism by sending vessels and carrying out other mild activities in contested water. These tactics have incited minor incidents but have not provoked military conflict. 19. "[In North Korea,] three things can be predicted. First, at some point in 2016, it is highly likely that [North Korea] will carry out some seemingly irrational action, from a nuclear test to sinking a ship. It will certainly engage in making bizarre threats. Second, the global media will become intensely concerned, feeling as if the world is on the brink of war. Third, no war will begin. It will all be part of the concerted and effective strategy [North Korea] has pursued since the fall of the Soviet Union." North Korea conducted two nuclear tests and multiple ballistic missile tests in 2016. The global media stayed concerned throughout the year, but war has not broken out. The United Nations has continued to denounce these moves. Sanctions are still largely ineffective, as Chinese enforcement has been lax. Meanwhile, the North Korean state is not suicidal and suffers from a severe power imbalance with South Korea. 20. "India, on the other hand, will feel the crisis in China less intensely than the rest of Asia. Politically, India will also be stable in the sense that none of its usual internal issues will worsen or challenge New Delhi’s status quo." India’s economy is growing, foreign direct investment is increasing and defense cooperation with the U.S. is on the rise. The unrest in Kashmir increased during the summer, which is something we did not expect to see. After a concerted effort, India quelled the unrest, which ultimately did not disrupt the status quo. Also notable is the deterioration of security along the border with Pakistan, though never to an extent that threatened the status quo. Pakistan-based Islamist militants staged an attack at a military base in Kashmir, which led to heightened tensions between the two countries. The status quo in this region – established after the 1999 Kargil War – called for New Delhi not to engage in cross-border retaliation for attacks. Nonetheless, the Indian government conducted surgical strikes against militant facilities on the Pakistani side of the border. Notably, a cross-border war did not occur and the year is ending with the status quo still in place. 21. The Taliban have surged in Afghanistan. The security vacuum created by a weak Afghan government and greater U.S. disengagement in the country allowed the Taliban to surge. They have taken over several districts across the country, particularly in rural areas. 22. "[Left-leaning governments] will start gradual political and economic reforms towards more center-right policies, such as opening up trade, providing incentives to attract investment, simplifying currency and tax systems and gradually reining in public spending. … These reforms will be put in place throughout the year and some results should be visible by the end of 2016." Political and economic developments in Argentina, Brazil, Bolivia, Chile and Peru all confirm this forecast. In Argentina, President Mauricio Macri reduced utilities subsidies, eliminated currency controls and removed barriers for some grain exports. In February, Bolivians voted not to let President Evo Morales run for another term in the 2019 elections. In the first round of Peru’s presidential elections, strong leftist candidate Verónika Mendoza finished third and did not advance to the second round of elections. Pro-business, open-market candidate Pedro Pablo Kuczynski won the election and replaced left-wing President Ollanta Humala. In August, Ecuadorean President Rafael Correa reiterated that he does not intend to run for office again in early 2017. In Chile, the government’s Nueva Mayoría coalition lost ground in local elections this year, while parties with more right-leaning leaders like former President Sebastián Piñera made gains. Brazilian President Dilma Rousseff was impeached and the Workers’ Party lost many mayoral seats in October local elections. The new Brazilian President Michel Temer passed government spending reforms and opened the country’s oil sector to more foreign participation. 23. The [center-right] reforms will also produce the secondary effect of making these countries more attractive destinations for foreign direct investment. At this point, we have reason to believe that our forecast regarding foreign direct investment (FDI) in the region may still come to fruition, though FDI levels in 2016 varied between countries. FDI data for the entire year is generally lacking and will likely be reported in 2017, so we rely on anecdotal reports and other evidence. Argentina is key to this forecast as the extent of its FDI gains, once the final numbers are in for the year, will help determine if the region has become a more attractive destination for investors. Brazil and Colombia are on track to see marginally better FDI levels in 2016. Peru and Chile will see less FDI in large part due to continued low commodity prices. According to the Economic Commission for Latin America and the Caribbean, Argentina received $11.65 billion worth of FDI in 2015. In October, the Finance Ministry said $49.5 billion worth of FDI had been announced by companies for 2016-2019. This shows a strong investment interest in Argentina but does not indicate what portion of the total sum was invested in 2016. Also, announced investments are not guaranteed, so we need to see if they will be implemented. According to the U.N., Brazil received about 57 percent of all FDI destined for South America in 2015. With the political crisis in the country winding down and the economic crisis having bottomed out, the country is attractive again to foreign investors. Brazil’s Central Bank reported at the end of 2015 that the aggregate median market expectation for FDI was $63.37 billion. The 2016 projection for this figure has increased from $55 billion at the start of the year to $65 billion. In Colombia, there was a slight uptick in FDI during the first half of 2016. According to the Colombian government, the country received $7.18 billion in FDI in the first half of 2015 and $11.73 billion for the year. In the first half of 2016, the government reported $8.35 billion in FDI, but no data beyond the second quarter was available at the time of writing. There was a notable decline in investment in hydrocarbons and rise in investment in utilities and transportation. The impact of the rejected peace deal between the government and rebels on investment for the year remains to be seen. Chile’s FDI in 2015 reached $20.46 billion. The economy in general has experienced a slowdown due to enduring low copper prices, which drive much of the local economy. According to Chile’s Central Bank, FDI from January to August totaled $8.68 billion. While the government has tried to attract foreign investment, we do not expect the country to receive enough FDI in the last four months of the year to equal or surpass FDI levels in 2015. In Peru, the Central Reserve Bank projected at the start of the year that the country would receive $4.59 billion in FDI in 2016. This would be less than the $7.88 billion Peru received in 2015. This appears to be on track with the Central Reserve Bank reporting about $2.6 billion in FDI received in the first half of 2016. Much of this is due to the strong role natural resource extraction plays in Peru’s economy and investment opportunities. 24. "[Venezuela] is an outlier due to the extreme, and often volatile, economic and political turmoil it faces. This plight will continue into next year. … Even if the opposition gains seats in the legislature, the end result will most likely be a government in gridlock." Venezuela remains mired in economic malaise and political inefficiency. Gridlock has prevailed throughout the year. President Nicolás Maduro has failed to govern the country while the opposition-led National Assembly has yet to remove Maduro from office. Since our mid-year report card, which was published in July, the government has worked to stall the progression of a recall referendum while the opposition escalated its marches and started exploring impeachment options. The international community is becoming more vocal against the Maduro government and in support of the opposition. International mediation efforts – led by former Spanish Prime Minister José Luis Rodríguez Zapatero and the Vatican – are currently underway. 25. Colombian voters rejected a peace deal between the government and the Revolutionary Armed Forces of Colombia (FARC). We did not mention the peace deal in our 2016 forecast, however, it was included in our mid-term report card. We stated that the deal could bring increased investment but did not anticipate the result of the referendum. We believed the biggest obstacle was having the government and FARC come to an agreement. The internal political divide between government supporters and supporters of former President Álvaro Uribe, who led the campaign against the deal, was underestimated. In addition, the level of voter turnout for the referendum was lower than expected. 26. "One can find a bright spot in sub-Saharan Africa’s economy in East African countries, including Ethiopia, Kenya and Tanzania. … In addition to high growth, these countries have large, low-wage working populations. The combination of these two factors makes these countries attractive and promising locations for a basic manufacturing industry." East Africa continues to stand out as an economic bright spot in sub-Saharan Africa, as countries there enjoy growth rates notably higher than the global average. The International Monetary Fund’s October 2016 World Economic Outlook notes that economic activity has slowed, with global growth averaging 3.1 percent in 2016 and projected at 3.4 percent next year. 2016 growth rates for East African countries like Ethiopia, Kenya and Tanzania are almost double that at 6.5 percent, 6 percent and 7.2 percent, respectively. Next year, Ethiopia is expected to grow 7.5 percent, Kenya 6.1 percent and Tanzania 7.2 percent. 27. "Although there may be particular shifts in the political situation, we see no general transformation likely to take place in 2016." No major transformations have taken place. The African National Congress (ANC) in South Africa has faced increased scrutiny and calls to relinquish power. In August, the ANC lost control of major cities like Johannesburg, Pretoria and Cape Town. Students and those generally opposed to President Jacob Zuma have increased their protests’ intensity and called for his resignation. More worrisome are the internal calls within the ANC to reform and for the party leaders to step down. However, when all is said and done, the ANC has not lost political power over the country. 28. Ethiopia experienced increased unrest. In our mid-term report card, Geopolitical Futures noted that tension and small-scale confrontations would continue between the Ethiopian government and Oromo ethnic group but would not put the country’s economic development at risk. These confrontations grew to a larger scale than anticipated in that they resulted in the declaration of a state of emergency. While the security climate may dampen economic performance in the immediate term, we still do not see this current bout derailing the overall economic development underway. How many times have you heard that saying? HOW MANY? The answer might surprise you. It is both, but it depends on the time frame. This is the sort of thing the scientists and eggheads at places like Renaissance Technologies have studied to no end. They would write academic papers on it, except that trading on this knowledge is a lot more profitable than writing an academic paper1. But in my experience, in the short term (seconds and minutes) markets mean-revert, but in the long term, they trend. Now, let’s just say right from the beginning that nobody here should care about what markets do in the short term, because computers are better at trading in the short term than you are. If you are day trading something like the Direxion Daily Gold Miners Index Bull 3X Shares (NUGT), you are doomed in about 14 different ways. So in the long term, markets trend. A question: Do you think this chart is trending? It looks like it is trending strongly. So why are so many people betting that it is going to go down? 2. People have a pathological need to be right when others are wrong. If you short stocks and you are right and everyone else is wrong, you feel like a hero. Remember, the goal isn’t to be right, the goal is to make money. Am I bullish on stocks? I guess. I actually don’t have strong feelings about it. But the trend is higher. And it’s not only higher, it’s relentlessly higher. 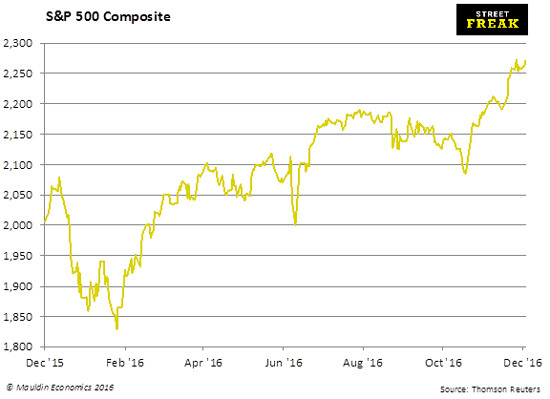 And if you look at this from a fundamental standpoint, something big and important happened a month ago that will have effects on financial markets for years. Not sure it is the best idea to bet against the trend just one month into it. People are pointing to sentiment—everyone is supposedly max bullish. 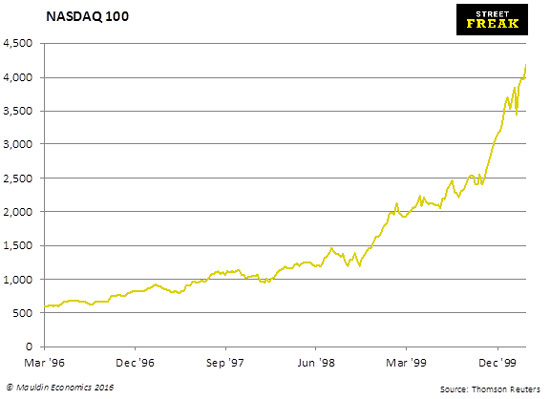 Well, everyone was max bullish during the dot-com bubble, and stocks still went higher nonetheless. 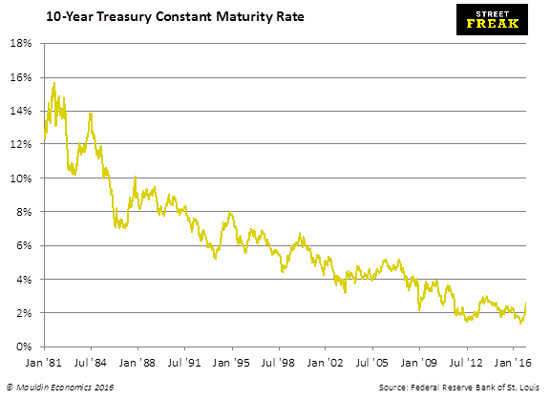 Like with the bond market—we are just a few clicks away from having irrefutable evidence that the downtrend in yields has been broken. When that happens, you can only trade bonds from the short side, not the long side. I often get accused of oversimplifying things. Some concepts in finance are complicated and should remain that way. But when it comes to money management, if it ain’t simple, it can’t be good. The trend is your friend. It was about nine years ago that I learned, as a trader, that I didn’t have to like a trade to be in it. That was the first time that I started using my head instead of my heart. I started buying things that I didn’t like, but bought them anyway because the chart was going up. This money management lesson hereby concludes. For more info, please go back and read the old Market Wizards books. Ray Dalio with another blindingly intelligent macro post on LinkedIn, of all places. I am grateful to receive these missives, but they don’t give me any particular edge, because everyone else gets to read these too. He goes on to say that the impact of the Trump administration will be bigger than what eggheads like me are calculating from tax and spending changes, because it could “ignite animal spirits and attract productive capital.” There is a lot more in the post, which you can read here. Go and read the Ray Dalio LinkedIn post and tell me if you think 1), 2), 3), 4), 5) and 6) are going to turn around and go the other way. The Trump administration hasn’t even started yet! In fact, I think the only risk to these Trump trades is Trump himself. The guy is known to change his mind. Like, he one day just decides that Richard Cordray isn’t such a bad guy and the Consumer Financial Protection Bureau (CFPB) does good work. Or he changes his mind on taxes. Or whatever. So the challenge here is to think about what is priced in and what’s not. Lots of people think that the entire four years of Trump have been fully priced into financial markets, one month after the election. With stocks up 3–4% or so. With 10-year note yields up 1%. That is absurd. Please note that I have a lot more conviction on 2)-6) than I do on 1). Here’s one more tip before I go. If you’re smart, like I suspect a lot of 10th Man readers are, you’re going to overthink this. Don’t be smart. Be dumb. Trump good. Buy stocks2. Sell bonds. Taking next week off—hope you enjoy the holidays! 1 We are deprived of a lot of knowledge of how financial markets behave because the smart people figure this stuff out and keep it a secret. 2 Like I said, less conviction on stocks, more on everything else.